As the number of cyberattacks have grown in frequency, government organizations, financial institutions, healthcare organizations and corporations in all industries understand the importance of professionals who will keep their confidential information, private records and their overall information secure. 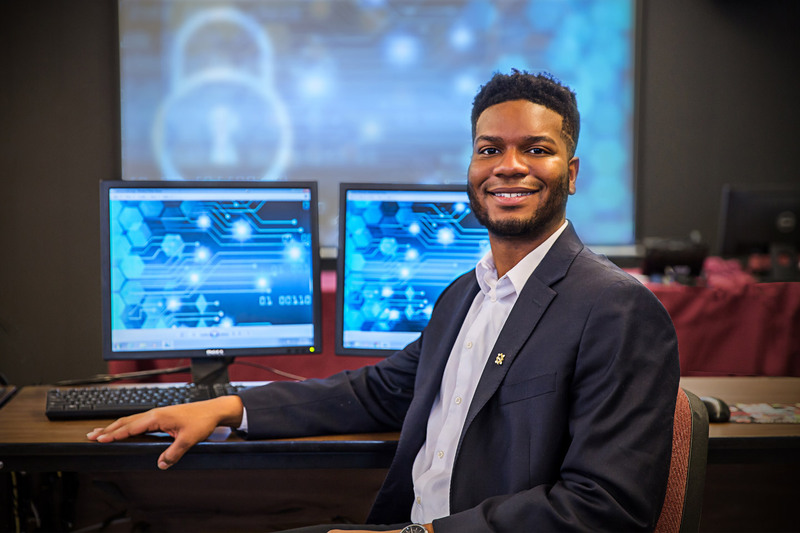 The online Bachelor of Science in Cybersecurity degree program is designed to prepare a generation of students to enter the workforce equipped to create innovative solutions to protect information in the face of hackers and growing cybersecurity threats. Through your study you will gain a wide range of experience and a deep understanding of the cybersecurity field as you take courses in areas such as cybersecurity, systems analysis, cybercrime and information warfare, encryption techniques and more. This program will provide you with knowledge in the specialty areas needed to complete the CompTIA Security-Plus (Security+) cyber certification examination(s), covering network security, compliance and operational security, threats and vulnerabilities, application, data and host security, access control and identity management and finally, cryptography. Gain hands-on experience working in our cybersecurity lab applying your knowledge in areas such as cyber-attacks and defenses, cloud security, and cybercrime and information warfare. Learn from faculty who are experts in the field of cybersecurity and have extensive background experience working in both industry and government. Intern with a local organization and gain real world experience putting the cybersecurity theories and applications you’ve learned in the classroom to the test. Work under the supervision of experienced faculty as you complete an independent study, applying your learnings to a research project relevant to the field of cybersecurity. Benefit from the flexibility of classes that fit your schedule and support 24/7 for online learning students. Bachelor in cybersecurity graduates will be prepared for demanding positions in public and private sectors overseeing, operating, or protecting critical computer systems, information, networks, infrastructures and communications networks. These graduates typically pursue careers as information security analysts particularly in the banking and financial industry, healthcare industry, governmental organizations and within the military. Students who choose to pursue a graduate degree following their bachelor in cybersecurity are well positioned to pursue graduate degrees such as a MS in Cybersecurity or a MA in Information Technology Management. This program prepares graduates to secure information security analyst positions immediately upon graduation by immersing them in a cybersecurity program grounded in theory and based upon practice. Our cyber-lab provides students with opportunities to learn about cybersecurity through ‘hands-on’ application. The Bachelor of Science in Cybersecurity degree at William Woods University consists of 124 distinct credit hours for graduation — including 57 core major credits and a capstone component. This course will examine digital forensics as it relates to both civil and criminal investigations. Topics include best practices in securing, processing, acquiring, examining and reporting on digital evidence as well as an examination of software programs such as Encase™, which is often used in digital investigations. Issues addressed in this course include descriptions of the types of crimes and terrorist acts committed using computer technology, theories addressing hackers and other types of digital criminals, an overview of the legal strategies and tactics targeting this type of crime, and in-depth coverage of investigating and researching digital crime, digital terrorism, and information warfare. Additionally, upon completion of the course, students should find themselves better prepared for further study into the growing problems of crime, terrorism and information warfare being committed using computer technology. This purpose of this course is to introduce the student to the various ways in which individuals and corporations can secure their information resources. This course will cover physical and architectural methods as well as examine legal, ethical and privacy issues (national and international context) along with practical applications related to the development of effective information security measures intended to mitigate current and emerging threats and vulnerabilities. This course will focus on the fundamental principles of information security management from a systems perspective. While other courses will provide the deep dive into specific areas of security, this course will serve as an exploration into the varying principles of systems-level information security management that are employed to achieve secure solutions. In this course, students are expected to synthesize and integrate the learning experiences acquired throughout the BS in Cybersecurity program. They will be expected to evaluate current and future topics relevant to this major. Prerequisites: Senior standing in the Cybersecurity program. This course prepares student to develop application programs in the database environment. Models of data, data structure and file organization are covered. The features of centralized, decentralized, and distributed systems are explored. Special emphasis placed on LAN (Local Area Network) technologies. This course is an examination of the knowledge sets, skills, tools and techniques of project management, with an emphasis on how project management contributes to the strategic goals of the organization. The course focuses on the role of information technology as an integration tool in project management. Topics: Microsoft project, work breakdown, structure development, resource scheduling, developing a project network, project organization, time management, and performance measurement and evaluation. The course also examines the managerial competencies required to organize and lead a project. This course analyzes and assesses the managerial applications of Internet technology for a successful Web-based competitive organization. The application of management principles to business-to-consumer, business-to-business, and intra-business commercial ventures are examined. Topics: Electronic business models; the forces driving the widespread implementation of EC; the critical success factors for on-line retailing; proactive strategies for EC operations; on-line consumer trends and behaviors; web advertising and promotion strategies; EC and service industries; business-to-business electronic commerce models; electronic payment systems; EC strategy implementation; and environments that impact electronic commerce. The Systems Analysis course is a study of the methods for structured analysis and design of Information Systems. Topics include data definition, flow charting, data flows and more. From the help desk to the boardroom: where can your degree in cybersecurity take you?